The Senate has concurred with the House of Representatives, approving a total sum of N30,000 as the accepted minimum wage for the Nigerian workers following the prevailing economic realities of the country as against the N27,000 proposed by the Federal Government. After the Senate dissolved into the Committee of the Whole for the clause by clause consideration of the report of the Ad-hoc Committee on the National Minimum Wage on the National Minimum Wage Act CAP N61 LFN (repeal and re-enactment) Bill, 2019 (SB. 722), it then reverted to plenary and reported progress. The National Minimum Wage Act CAP N61 LFN (repeal and re-enactment) Bill, 2019 (SB. 722) was at the end of the day, read the third time and passed. For effective and efficient implementation of the new approved Minimum wage, the Senate has asked the Ministers of Finance; and Budget and National Planning to as a matter of urgency, compute and forward to the National Assembly for inclusion in the 2019 Budget, the actual amount required for the new national minimum wage. The Senate has also approved a fine not above N70,000 for not keeping records of employees, even as this is a sharp variation of a proposal of N5,000 by President Muhammadu Buhari as fine for failure to keep records of Employees. Senate's approval yesterday, followed the presentation of the Senate Adhoc Committee on a New National Minimum Wage Bill, 2019. Presenting the report yesterday at Plenary, Chairman of the Senate Adhoc Committee on a New National Minimum Wage Bill, 2019 and the Deputy Chief Whip of the Senate, Senator Francis Alimikhena, All Progressives Congress, APC, Edo North, said that the recommendations the recommendations were arrived at following the clause by clause consideration of the Bill and the prevailing economic realities of the Country. The Senate has also urged the Federal Government to put in place procedure that will lead to a review of the Revenue Sharing Formula to enhance States capabilities towards implementation of the new national minimum wage. In his presentation, Senator Alimikhena said that the Objective of the New Minimum Wage Bill is that it seeks to prescribe the National Minimum wage tor the Country and provide a legal framework for ideal review of the national minimum wage ln line with the period specified under the Bill. On the Analysis of the Bill, the Chairman said, "The 18-clause Bill provides for the establishment of a Tripartite Committee on National Minimum Wage by Mr. President with equal representation from the Federal, State Governments, Organized Labour and Organized Private Sector with the Secretariat to be domiciled in the National Salaries, incomes and Wages Commission. "The Bill provides that the Tripartite Committee shall compose of a Chairman, a Secretary, Government representatives (the Secretary to the Government of the Federation, Head of Civil Service of th Federation, Minister of Labour and Employment, Minister of Finance, Minister of Budget, National Salaries, lncome and Wage Commission and State Governor from each of the six Geo-political Zones to be' nominated by Governors from the Zones, representatives of the Nigeria Labour Congress, NLC, Trade Union Congress, TUC, Manufacturers Association of Nigeria, MAN, National Association of Chambers of Commece, Industries, Mines and Agriculture, NACCIMA, Nigeria Employers Consultative Assocation, NECA and such employers group that be registered in accordance with Labour Laws.
" Equally, the Bill provides for powers of birth Tripartite Committee and the relevant Officers of the Civil Service of the Federation to enforce the National Minimum Wage, Employers' Obligations, Monitoring and Compliance and Penalties for offenders." Vanguard had reported exclusively last week that the Senate Adhoc Committee on a New National Minimum Wage Bill, 2019, had agreed with the House of Representatives, recommending N30,000 as the accepted minimum wage for the Nigerian workers as against N27,000 proposed by the Federal Government. The paper had also reported that the report would be presented yesterday and passed same day. In his contribution, Senate Leader, Senator Ahmad Lawan, APC, Yobe North said, "This administration has fulfilled its promises of wage increase. It promised to give a new minimum wage to Nigerians and they have fulfilled the promise. This gesture should be appreciated. We do not have to wait until we are threatened with strike action before we take action. The Nigerian workers must show that the government is paying them and they are paying the government in service." Also in his contribution, Senator James Manager, PDP, Delta South who noted that it was very embarrassing that many states are not paying even the N18,000 minimum wage, said, "Despite all that has been happening, I believe the committee has done well. We need to always do things smoothly so that productivity will be high. It is embarrassing to know that the minimum wage is not applied by all governments." On her part, Senate Minority Leader, Senator Biodun Olujimi, PDP, Ekiti South who noted that Review of Revenue Sharing Formula was key to the implementation of the minimum wage because without it many states will not pay, however stressed that revenue sharing formula now is 56% for Federal Government; 24% for States and 20% for Local Governments, adding, "What we have done is to give the people a minimum wage. It is not worth it if the states are unable to pay the minimum wage." Also contributing, Senator Barnabas Germade, SDP, Benue North East said that with the action of the Senators, it was an indication that the National Assembly was not delaying the increase in workers' salary, just as he stressed that with the kind of money deployed to buy votes, it means the States have so much money to pay workers, adding, "This bill should be passed promptly to let the workers know that the National Assembly is not their problem." On his part, Senator Tayo Alasoadura, APC, Ondo Central said, "I believe that a minimum of half a million naira should be the fine for not keeping records of employees. Also, Local Governments have not been able to implement the N18,000 minimum wage. We must ensure a committee is set up to look into the revenue sharing formular throughout the nation." In his remarks, Senate President, Dr. Bukola Saraki said, "Let me join our colleagues to commend the efforts of the committee. More importantly, let me commend the patience of Nigerian workers and the leadership of the Labour Union, who have over the years been calling for this minimum wage and have carried their efforts responsibly. "I want to commend the leaders of the organisations of the union. Let me also state that as government, we should ensure that at times like these, we should not wait for there to be strikes to do what is truly deserving for our workers. "I hope that with this minimum wage our workers will double their efforts to increase their productivity, so that we can also improve the general productivity of the country. It is my hope that the implementation of this will start immediately." It would be recalled that the Senate President, Dr. Bukola Saraki on Monday last week, announced that following the absence of the Chairman, Senate Adhoc Committee on New National Minimum Wage Bill, Senator Olusola Adeyeye, APC, Osun Central, the Deputy Senate Majority Whip, Senator Francis Alimikhena, APC, Edo North to now head the panel in acting capacity. It would also be recalled that the Senate had on 24th January this year, set up an eight- member Adhoc Committee to look at the New Minimum Wage bill after scaling second reading, just as the Bill was referred to the constituted ad- hoc Committee. The Ad- hoc Committee had the Senate Majority Whip, Senator Olusola Adeyeye, APC, Osun Central, with the Deputy Chief Whip, Senator Francis Alimikhena, APC, Edo North, representing the South South; Senator Abu Ibrahim, APC, Katsina South who is the Chairman of the Senate Committee on Labour; Senator Shehu Sani, PRP, Kaduna Central, representing the North West; Senator Sam Egwu, PDP, Ebonyi North, representing South East); Senator Suleiman Adokwe, PDP, Nasarawa South, North Central) ; Solomon Adeola, APC, Lagos West, representing South West and Senator Binta Masi Garba, APC, Adamawa North, representing North East. The Committee was given two weeks to conclude its assignment and report back. It would also be recalled that the House of Representatives, had on 29th January, approved a national minimum wage of not less than N30,000 per month for Nigerian workers. The passage followed the lawmakers' unanimous adoption of a report of an ad hoc committee on National Minimum Wage Bill, 2019, which recommended N30,000 as against N27,000 proposed by the Federal Government. 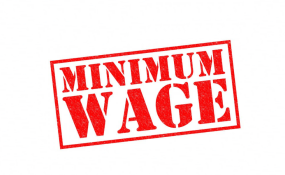 According to the Chairman, ad hoc committee on National Minimum Wage Bill and Deputy Speaker of the House, Yusuf Lasun (APC, Osun), the bill aims to prescribe the national minimum wage and a legal framework for a seamless review. Tagged "A Bill for an Act to repeal the National Minimum Wage Act 1981 and enact the National Minimum Wage Bill, 2019" the law makes it compulsory for employers in Nigeria to pay their workers no less than N30,000 per month. The Lower Chamber approved the minimum wage bill following its adoption by the ad hoc committee on the report presented to the assembly by President Muhammadu Buhari. Copyright © 2019 Vanguard. All rights reserved. Distributed by AllAfrica Global Media (allAfrica.com). To contact the copyright holder directly for corrections — or for permission to republish or make other authorized use of this material, click here.